If you’re flying from Don Mueang airport today or tomorrow and you’re the type of traveler who arrives at the last minute, you’re in a not so good situation. Yes, this is bad news for you, friend. Don Mueang authorities advised passengers to arrive three hours before departure due to heavy air traffic. There will be a Thai Air Force show taking place to mark Children’s Day on Saturday. That applies to both domestic and international flights, Don Mueang airport boss Petch Chancharoen said, Bangkok Post reported. Don Mueang will be used for air show rehearsals today, the 8th, and the show tomorrow, the 9th. According to Coconuts Bangkok, 37 flights will be cancelled, but airlines will work with the airport to adjust timetables and reschedule flights so as to minimize flight delays. It is expected that Vibhavadi Rangsit Raod will be hit with heavy traffic so everyone is advised to leave earlier than usual. Your airline should inform you of any changes or whatnot to your flight. 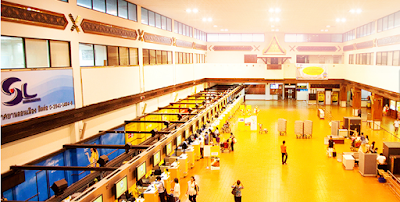 To get more information, you can also visit Don Mueang airport website at http://donmueangairportthai.com/.